A recent study from the Pew Research Center indicates that the average American voter no longer turns to the editorial page of the daily newspaper for election guidance. Remember, it was the Great American Newspaper that convinced many readers that Dewey could easily beat Truman in the 1948 presidential election. One nationally respected daily newspaper even went so far as to announce that Dewey had soundly defeated Truman in the race. What, you don’t remember President Dewey? Then there were all the newspapers that endorsed Richard Nixon as the presidential candidate who could “bring us together” again. Yeah, that worked out just great. And, of course, there was President Bush. And President Bush. I’m not even going to touch that little bundle of national nerve endings. People just get all, like, agitated. So is it any wonder that voters are slowly turning away from their daily newspaper and network news to look for political guidance elsewhere? According to the Pew study, people are scouring the Internet, cable news sources and, er, “Saturday Night Live,” in a never-ending search for election expertise. Hey, I always check out two or three late-night comedy shows before voting, but I also use a few tried-and-true information sources that have never failed me when it comes to making the right decisions on election night. Normally, I keep these sources pretty close to the vest, but in these troubled times with another big election on the horizon, I’m willing to share. * Barber Joe. He has a barbershop on Main Street in downtown Vacaville. He knows a lot of stuff. If you play your cards right, he may share some of his knowledge with you. If not, you’ll still get a haircut. There’s supposed to be a barber almost as knowledgeable as Joe in Plumsteadville, Pa., but you couldn’t prove it by me. * Any golfer (particularly if they’re wearing really goofy-looking shoes). These guys have their thumbs on the pulse of America. Many of them are, in fact, politicians. You don’t necessarily have to follow any of their recommendations, but at least you’ll have a good idea of just how truly weird things can get in an election year. * The guy on the third bar stool from your left in any tavern in America. You’ll know this guy is the real deal because he’ll either be a former Navy SEAL, Green Beret or Vietnam-era sniper. And he’ll tell you so, again and again and again. Then, if you promise to keep it to yourself, he may also give you some election tips and tell you where Jimmy Hoffa’s buried. Really. * The Weekly World News. 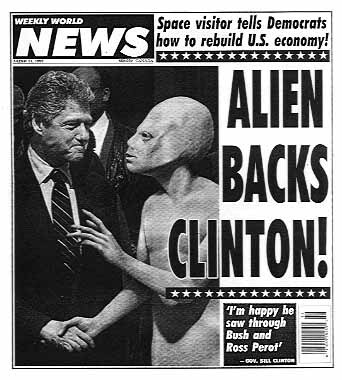 Sure, it looks like just another supermarket tabloid, but it was the only newspaper that gave you the lowdown on the space aliens who conferred with both Bill Clinton and George Bush. Did the New York Times have that story? I don’t think so. See you at the polls, amigos.